A unique and popular child’s toy emerged in the early 19th century—the paper theater. Mirroring the grandeur of the great stages of London, Paris, Berlin, Vienna, Copenhagen and other world capitals, these colorfully designed and skillfully executed paper theaters flourished in the living rooms of families for generations, offering creative and educational activities for budding young actors and theater impresarios. This retrospective of a private collector includes over a century of paper theaters from England, Germany, Denmark, France, Spain, Italy, Austria, and the United States. Supported by the Barton Family and the Charles M. and Deborah G. Royce Exhibition Fund. The exhibition A Child’s View: 19th-Century Paper Theaters, opening on Saturday, October 30, 2010, and on view through January 30, 2011, showcases approximately 35 colorful, antique paper theaters plus related materials from the personal collection of Eric G. Bernard of New York City. 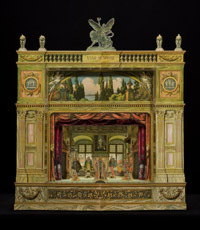 Before the availability of children’s periodicals and mass-produced toys, small tabletop theaters constructed out of printed paper, adhered to cardboard and mounted on a wooden frame introduced a unique visual entertainment into homes. Marketed to children for their entertainment and educational values, paper theaters engaged young audiences, and from contemporary accounts, adults as well, with countless hours spent on intricate preparation and performance. More than a mere toy, the theaters allowed children to expand the limits of their imaginations, creating entertainments as good as their efforts and talents allowed. Nearly every major European country as well as the United States developed its own tradition of paper theater during the 19th century into the early 20th century. théâtre de papier in France. England had over 50 publishers, Germany 54, Spain 14, France 13, Denmark 10, Austria 9, and the United States 5. All of these versions to some degree were derived from the ability to mass produce the printed image, initially from engraved copper plates, followed by color lithography in the mid-19th century. The relative sophistication of the visual and theatrical elements of paper theaters makes it puzzling as a child’s plaything. 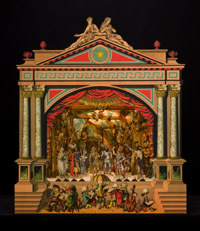 Most paper theaters were complete with a stage front or proscenium, scenery, actors, and a small printed booklet with the dialogue, the scene setting for each act, and directions for the movements of the figures. These toys were challenging for young people, yet their popularity must have been widespread, given the large number of printers and publishers engaged in their manufacture. Today, these small theaters and their vast repertoire of plays remain valuable records of professional performances and theater design of the 19th century. Sometimes created from fantasy, often the scenery and costumes were faithful representations of actual stage productions, as recorded by sketch artists sitting in live theater performances, or designed exclusively for the paper theater by professional theatrical designers. There is even a sense of the style of 19th-century acting from the attitudes and positions of paper theater figures and actors in theatrical portraits. Uncle Tom’s Cabin was published as a paper theater play in both England and Germany, an indication of its great international popularity. 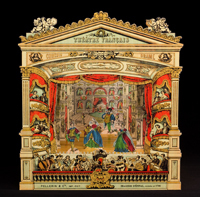 For all of its wide-ranging manufacture and influence, the paper theater was primarily a 19th-century phenomenon, with occasional minor resurgences in popularity in the 20th century. 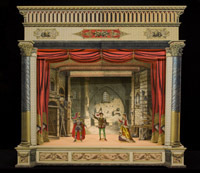 Fortunately, the wonder of paper theater has been preserved through collectors and a very few, but fine, players performing with traditional paper theaters and in contemporary interpretations of miniature theaters made of paper. To this day, there remain organizations in England, Germany, and Denmark dedicated to the study and performance of paper theater. A Child’s View: 19th-Century Paper Theaters will include a 25-page four-color brochure and a full array of public programs that include “Paper Theaters Family Day” on Sunday, December 12, 2010, featuring performances at 2 p.m. and 4 p.m. by Joe Gladwin and his Paperplays Puppet Theater, and “Paper Theaters School Vacation Workshops,” December 28 through 30, 2010, from 10:30 a.m. to 11:30 a.m., suitable for students in grades 1-3 of all abilities. For workshop information, call 203-413-6740. Click here for more on the exhibition programs for A Child’s View: 19th-Century Paper Theaters. For more images from the exhibition A Child’s View: 19th-Century Paper Theaters, click here. Click here for images from the opening reception for A Child’s View: 19th-Century Paper Theaters.